Like many people in the world of ELT I was shocked and disappointed by the results of the EU referendum this morning. Like many people in our position, my wife and I have been sitting on the sofa in our house in central Portugal, in a state of bleak disbelief struggling to understand both how the British people could have made this choice and of course, what the ramifications are for us. We are asking ourselves questions like: Should we stay here? If we want to stay here, how do we go about it? Should we go somewhere else? Should we return to the UK? Do we even want to return to the UK? How on earth are we going to make that happen if we do? There is a lot of anxiety in our thinking, a lot of uncertainty and a lot of speculation, none of which adds up to anything substantive and none of which is particularly helpful to us, or anyone else in a similar situation. My hope in this post is to try and look at what the decision means for ELT and thereby to help myself, and all those teachers around Europe in similar situations, figure out what this really means for us. Some 26,500 jobs in the UK are directly linked to ELT (English UK, 2015), though some of these are indirect and supported by student spending in the UK, rather than say, teaching jobs or centre administration staff. 650,000 students come to the UK to study annually, the majority from Italy and Spain with 53% of students coming from European countries. It seems likely that these figures are going to drop, partly because of the economic uncertainty and recessionary conditions, but also partly because if there is no automatic right to travel and study in the UK, EU citizens will need to pay out £328 on a Tier 4 student visa just to come to the country. This is obviously speculation and it may not be impacted, this depends on the conditions that the EU requires as part of any renegotiated trade deals. However, given the focus on migration to the UK in the referendum debate, stricter control over borders and visa issuing seems likely. The 2011 Department for Business Innovation and Skills (BIS) report analysed the impact of changes in immigration controls on Tier 4 visas and suggested it would lead to a 10% reduction in the number of tier 4 visas granted and a consequent loss of £203 million per year (rising to £268 million by 2025). Extrapolating these trends to take into account the additional drop in visas issued to EU students, this suggests the UK ELT industry could lose around £493 million a year. This is likely to have a significant effect on the number of centres offering language teaching, the incomes and revenues that centres are likely to realise, of subsequently of course, on the number of jobs, with the possible loss of 2,500 jobs in the sector. This in turn is likely to drive wages down because of the lower demand (and a need for employers to reduce costs) and because of the increased supply of teachers looking for work. 94% of secondary students in EU countries study English (Eurostat, 2016). This is unlikely to change any time soon, mostly I suspect because of inertia. Schools and education systems have invested so much time and energy in creating the materials and training the teachers that it may take some time before other languages gain in primacy. This is the state sector though, and the private sector may be different. It is difficult to see though, the levels of demand for English language training sustaining themselves in the private sector when much of the motivation to learn the language is gone. With no freedom of movement into the UK to live and work, students like many of mine who are learning a language because they want to work overseas, may choose other destinations and languages. This is speculation though, and English is still the language of business and international communication, so the impact may be mitigated. There is likely to be a much larger impact on recruitment on teachers. Companies and organisations operating within the EU must, first and foremost, hire workers with the right to work within the EU. In other words, EU citizens. If an employer wants to hire a non-EU worker, they first have to prove that they cannot find anyone in Europe who can fulfil the vacancy. The implications of this are simply that a large number of UK nationals who are currently teaching in Europe are likely to find themselves legally unable to continue in their roles. Brexit may, inadvertently, have effectively settled the NS / NNS debate (at least in Europe). If you are a UK national between 17 and 30, you might be able to qualify for a Temporary Worker / Working holiday visa and then teach on short term contracts here and there. For everybody else there are the traditional routes to consider: marrying into the EU or for those who have been there long enough, applying for citizenship. It’s probably still too early for the full ramifications of the decision to be apparent. David Cameron has said he’s resigning and that it will be the job of the next Prime Minister to invoke Article 50 of the Lisbon Treaty, thus triggering the two year period of UK exit. Boris Johnson has said there is “no rush” to leave. EU leaders have called for the UK to get on with it and avoid “unnecessarily prolonging uncertainty”. It is quite a strange situation – everything has changed and yet nothing has. Speaking personally? It leaves me depressed, angry and morose. My options are (1) to apply for Portuguese citizenship and to try and continue life here in Portugal, (2) to try and sell the house and uproot the family and move back to the UK to compete for an increasingly smaller pool of jobs at increasingly lower wages. Unless anyone can think of another option…? Does anyone know if Canada is hiring? Economic Impact of ELT in the UK – English UK, 2015. Estimating the Value to the UK of Education Exports – Department for Business, Innovation & Skills, 2011. Foreign language learning statistics – Eurostat, 2016. Tier 4 (General) student visa – www.gov.uk, 2016. Interesting post, and the first one I’ve seen to emerge so far on how Brexit might affect our industry. Well done for being among the brave first few to comment, as it’s always hard to do more than speculate when (1) things are at such an early stage, and (2) everyone is shocked and exhausted. I think the point you make about impetus to continue studying English is an interesting and important one. Speaking from a background in studying ELF (English as a lingua franca), I’ll personally be fascinated to see the nature of the continued use of English as a lingua franca among a group of nations who no longer counts any L1 (or “inner circle”) Anglophone countries among its members, except for Ireland of course. (And of course, I don’t mean to suggest that Ireland is a negligible player in the EU, but my point is that they are less frequently pointed to than Britain as somehow ‘owning’ or representing the English language, and their population is considerably lower, too.) Given the existing instrumental usefulness of ELF among EU members, I think it unlikely that use or study of English will diminish any time soon, but the goalposts may well move in terms of what is generally considered necessary, sufficient or acceptable usage/proficiency. As I type this (bleary-eyed from little sleep last night), I feel like it could come across as somehow negative in tone. But I actually mean to be optimistic for the English language and those of us who learn and teach it. Removing a large cohort of ‘native’ English speakers from the EU but leaving ‘their’ language to carry on doing its own thing, safe in the hands of millions more people from other nations, is going to be an exciting and fascinating thing to observe in the coming years – and thus perhaps the only aspect of Brexit that I’m currently looking forward to, albeit in a somewhat bittersweet way. 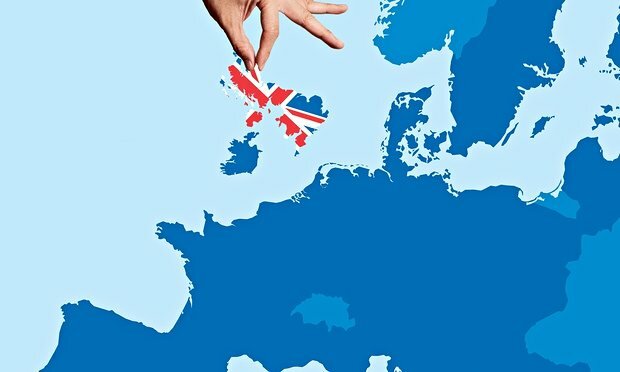 I think it’s fair to say Scotland and possibly Northern Ireland will also continue in the EU, whether as independent states or as sort of inverse Denmark status-holding areas. Thanks for writing this. I don’t think the interest towards the English language will diminish, but I do see a great opportunity for Ireland to become the new nr. 1 country where Italian students will go to improve their English. As you say, it’s too early to tell, but the future of the sector doesn’t seem bright. I too am a British citizen living in Portugal and I’m also asking myself the kinds of questions you are. I’m trying not to do anything rash and want to avoid getting myself into a situation that I’m later going to regret, but it’s hard to remain level-headed. Regarding the bigger ELT picture, I think that in the long-term there will be a decline in the need for English. I just can’t see people wanting to jump through hoops to work or even study in the UK when they can go to Ireland. I also agree with Laura Patsko in regards to the possibility of the language losing its position as a lingua franca. This alone will have an effect on us as teachers of EFL! Now another question to ponder is: what countries are next? And how will that affect us personally and professionally? To clarify: I did not mean to suggest at all that English will lose its position (that is to say, its role) as a lingua franca. On the contrary, I think it is likely to continue to be widely used throughout the EU as a lingua franca, hammering another nail into the coffin of the outdated and illogical notion that the English (or the British, or any other L1 English-speaking population) somehow ‘own’ the language. To say that British people as a nation don’t welcome Europeans is inflammatory and -with respect- nonsensical. There is no such thing as “British people as a nation”. A more nuanced understanding of this election would reveal that people voted for many different reasons (and in answer to many different -and unasked!! !- questions). I hope I haven’t offended you, but I am getting frustrated by the simplistic reductionism that says that this is about how people in Britain regard Europeans. I don’t think for a moment that I have said that the British people don’t welcome Europeans, so your comment labelling my post as “inflammatory and nonsensical”, frankly, just annoys and confuses me. I understand that there are a whole host of reasons why people may have voted out, including the reason “couldn’t think of a good reason to stay” and that’s absolutely fine. Your choice is your choice. In this post, I deliberately tried to stay away from analysing the whys and wherefores of other people’s decision making processes because it isn’t really relevant. What I have tried to do in the post is look at what the decision means for me, and thousands of people like me. You might not agree with my analysis, but I have yet to see an alternative perspective on the implications for ELT and would welcome any facts or evidence that might shed light on what could happen. I’m afraid you’ve misunderstood me, David. I have probably pressed reply in the wrong place.I was attempting to reply to Miss Andi’s comment, not your more analytical post. Apologies for having inadvertently confused and annoyed you. Thanks for this piece which reflects what many of us are feeling today. I would like to say however that I firmly believe English will still be of primary importance in the teaching of foreign languages around the world. It is not just business and communication but also science, music, entertainment, etc. I work with PhDs in natural sciences who need to write in English in order to publish in journals which have a large impact in their fields. Students in law or government find that the language they need to do their jobs is English. I see that many things will change, however. As an American I have always needed to get a residency/work permit to live and work here in Austria, but after a certain number of years it is not a problem to get. We can’t predict with certainty how all this will pan out, but I think we can take a deep breath and hope for the best. We are all in this together and we are resilient, one of the reasons many of us are still working, teaching, writing, going to conferences and believing in our chosen profession. I am an accidentally dissenting voice here. I’m nervous, but not worried. Nor am I shocked at the news today; I’m not dismayed. I don’t see it as a statement of isolationism or a rejection of European values (whatever they might be!). In total, the Top Ten non-EU countries sent just over 205 000 students. It doesn’t make it alright, but things aren’t disastrous just yet. Of course, we are likely to be in the EU for a few years, and word from Germany is that Merkel is keen for us to get some sort of associate status. The broader picture is that EU governance was leaving a lot of Europeans without the money to study abroad. 2014-15 saw a drop of 12 000 EU students and the highest ever numbers of non-EU students. I am hopeful that this vote will force the EU bureaucracy to think seriously about its policies of austerity and free market trade. But this is just speculation too. The truth is we know nothing about how things might pan out. What we do know is that the only thing that has happened to date is that the British electorate have signalled to the legislature that just over half of those who vote want to leave the EU. That’s it. The rest is just reaction. Under the acquired rights section of the 1969 vienna convention if you live in a country party to the treaty (most eu countries are, France isn’t) they won’t be able to retroactively remove previously acquired rights. Whether that will affect EU companies being obliged to find EU citizens for a job before looking for non EU candidates I don’t know. This rule doesn’t seem to have had much influence in the UK. I hope this may ease your fears. However truth be told they have pretty much just torn the rule book up so who knows what will happen. I suspect here in Spain I will be charged for health care almost immediately post article 50 announcement. thank you for that . this is somewhat more reassuring and suggests that teachers with permanent contracts with employers might get to stay on without having to alter their status. I know though, that many teachers, certainly those I know working in Portugal, work on fixed term contracts. It seems, from what you say, that once those contracts fulfill their terms, the schools would need to re-recruit and from then on would need to comply with the EU regulations. We shall see. Or the Tories will acquiesce to freedom of movement in order to maintain access to the single market and absolutely nothing will change whatsoever. 1) Irish NETs will effectively move to the front of the line for English language gigs in Europe. 2) If an English language school in Europe does hire a non-EU teacher, Brits will effectively be competing with Americans, Canadians, and South Africans from now on. Hopefully this means more qualified teachers are heading to China to teach 🙂 I would say that is option 3 🙂 I am the HR person (phil.yu@eagletw.cn) for a school chain in China, welcome to join us! This was a decision by England&Wales alone. There will still be a need for ELT for the Scots, who are choosing to remain in Europe rather than the EU by ending the United Kindom. ELT is a huge worldwide sector. Europe is only actually a very small percentage of this sector. I wouldn’t think that there is an abundant amount of new growth for ELT in Europe at all. However, the hottest zone for ELT development is definitely Asia. Not only is the population many times larger than that of Europe, most Asians are very seriously desiring to increase their competitive edge in an already very intensely competitive environment and learning English is a prerequisite. The trend is a huge transfer of wealth also from the West to the East. In fact, in many universities across Europe and especially in the UK, the largest growing cohort of students is from Asian, particularly China. Many master’s degree level courses are dominated by Chinese students. PhD programs are also filled with Chinese students and many of these Chinese students are able to secure professorship positions within UK institutions once they have finished their studies (one of my best friends, educated in an elite program at Beijing University has gone on to follow this route very successfully). So, while it may feel like a very large impact for the ELT community from the UK, rest assured it’s not a large impact at all for those involved in ELT elsewhere. It simply means that for UK citizens involved in ELT, they will no longer have a corner on the market in Europe and this may force European countries (and the EU) to loosen its restrictions on employment of native-speaking English teachers from other countries. In short, it will give such teachers with qualifications and experience from countries such as Australia, New Zealand, the United States, South Africa, and Canada a possible open door to come and live within Europe and teach (not that they would prefer to, considering that Asia is definitely a more lucrative market). For sure, this will be disruptive to the status quo, but for those of us who are not from the UK, it is not necessarily a negative situation. Additionally, it will mean that UK citizens involved in ELT throughout Europe will just have to go through the normal routes that all the rest of the ELT teachers around the world must go through when seeking employment in a different country (obtaining visas and permits etc.). It might seem like a huge shock, but this is the normal, everyday reality for those involved in ELT from the above-mentioned countries (populations of those countries combined equals about 475 million people vs. 64 million in the UK). I have lived and taught in the ELT sector in Asia since I was in my early 20s (so, about 15 years) and have run into a lot of teachers from the UK who do well here. But, we are all equal in that we all have to get visas and get approved and only the best of the best get and keep jobs for that reason (I personally hold a full master’s degree in TESOL as well as a PGDE and have 15 years ELT experience and I’m one of the ‘lesser qualified’ individuals here)–no one is a ‘shoo-in’, so to speak. So, the competition for those involved in ELT in the UK just got more difficult, that’s for sure. But, at the same time, it is now a more equal playing field for ELT overall. I do hope that you are able to keep your job in Portugal or make the decisions you need to about your future with ease. The reality is, there is no guarantees–no matter how settled anyone ever becomes in a country. That’s just my take on this situation from the outside. I understand this might be a difficult and confusing time for EFL teachers from the UK wherever they are based, but the idea that Brexit will affect students’ motivations to learn English is a bit absurd. People don’t learn English just to go to the UK, do they? And while it will (probably) mean that EU countries will employ more European teachers of English, it will also likely impact the general hiring processes of those countries (as you point out). Basically it will mean that EU countries will need to be more welcoming of NES teachers from non-EU countries – like South Africa, Australia, Canada and the US, or at least UK teachers will understand the hoops we have to jump through to get jobs in Europe. I can see how this is a huge blow to UK teachers but it just means you get to experience the EFL job market like the rest of us. In all honesty though, I’m not convinced that the freedom of movement and the right to work will actually change. Even if it does, there’ll still be people wanting to learn English and you’ll still be able to find jobs! Reblogged this on Exploring languages worldwide..
Now you’ll be in the position we Yanks have been in for years, and I am very sorry for you. I had never thought about the impact of Brexit on ELT but for sure less EU students will go to the UK if they need visa to study and attend language schools. Great post David. Feel the same as you do. An amalgamation of hope and fear! As expected. Above all, I’m a TEFLer teaching IELTS to the Iranian candidates, so we are sharing the same feeling of uncertainty with you. What aggravates the situation is the over-dependence on English as an international language and IELTS exam as the gatekeeper for most non-native speakers of English who are preparing themselves to move abroad, especially EU. I wonder if English still retain its position as a common European language. Is the result of the referendum considered as the final decision?